Dandelion is so much more than a pesky weed on your lawn! It is actually a very effective diuretic, which means it helps to pass excess fluid out of your body through your kidneys and bladder. Unlike some prescription diuretics, Dandelion is rich in potassium so your body does not end up losing this valuable mineral due to the increase in urination. Dandelion is a cleansing herb that has often been referred to as both a ‘liver tonic’ and ‘blood cleanser’. Its cleansing action makes it an excellent herb for relieving skin conditions such as eczema. As well, Dandelion helps with the mechanics of digestion by stimulating one’s appetite and releasing bile to assist with the proper breakdown of foods – especially fats. Dandelion helps to relieve dermatological conditions and is used as a diuretic. Adults: Take 2ml, 3 times per day on an empty stomach. For occasional use only as a diuretic. Do not use if you have liver or gallbladder disorders or a bowel obstruction. Discontinue use and consult a healthcare practitioner if you develop symptoms of liver trouble. 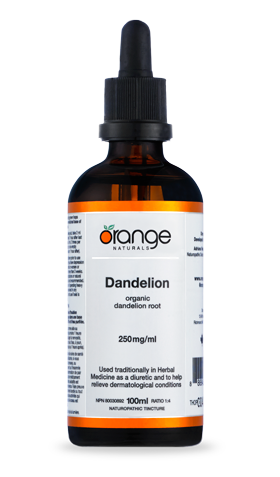 Each ml contains 250 mg of organically grown dandelion root (Taraxacum officinale). It is a 1:4 root extract.